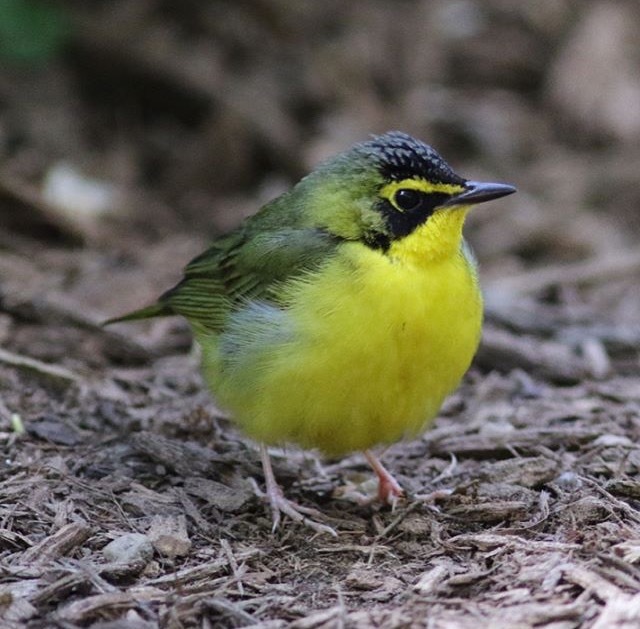 A Kentucky Warbler stopped over in Washington Square Park for two days last week. The sighting of this rare bird caused a flash flock of humans to gather at the site of its layer, just northwest of the arch. 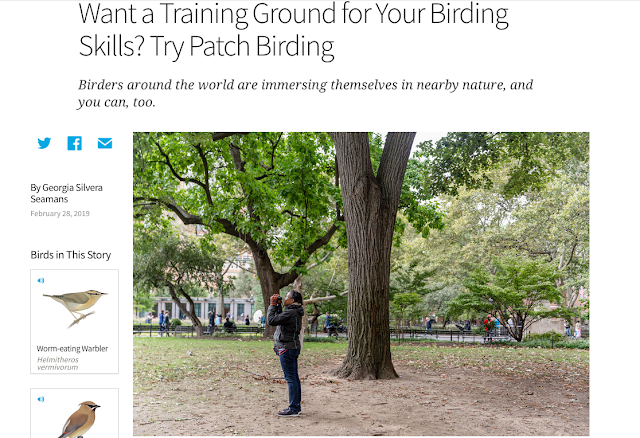 I wrote the First Annual State of Nature Report for Washington Square Park on behalf of WSP Eco Projects in April and given the buzz around the park's bird life, I thought I'd share it here. As I write this report about Washington Square Park, this treasured greenspace is blooming with cherries, crabapples, and magnolias. Year-round and migrating birds are foraging, nesting, and resting in the park. Smaller animals are also present; we are seeing butterflies and flies in greater numbers in the park. The idea for Washington Square Park Eco Projects (WSP Eco Projects) germinated more than four years ago with a mission to showcase and celebrate the nature of the park. WSP Eco Projects formally launched in 2014 after a successful fundraising campaign on ioby.org. Our first goal was to map all the trees in the park and the historic and modern routes of Minetta Brook, a stream that used to run aboveground from its confluence at 11th and 12th Streets between 5th and 6th Avenues through the park and then southwest to empty into the Hudson River at present day Charlton Street. There are more than 300 trees in the park. [Note: a count of 338 trees have been made in the park but this does not represent the total number of trees in the park. At 9.75 acres, there are approximately 34.6 trees per acre.] The WSP Eco Map does not show the locations of shrubs or herbaceous perennials though recently some of this data was captured via iNaturalist during the City Nature Challenge 2017. Since the map’s launch we have expanded the scope of our work. We offer park-based educational programming, which has included the 2014 Family Nature Scavenger Hunt and seasonal tree walks in 2014 and 2015. We partner with local nonprofits and large institutions on programming, too. Last fall, we co-sponsored an oak planting workshop and a winter tree walk with the park’s conservancy. We curated a cube of nature picture books and field guides for the Uni Project, which set up a reading room in the park in September. Authors and publishers donated most of the books in our collection. We also contributed an ecology game to the reading cart, a Nature Bingo Card designed for us by The Bird Feed NYC. It is a great game and we will bring it back to the park this year. We also engage in research. With a permit granted by NYC Parks Natural Resources Group, we are in year two of a wildlife survey. NYC Parks permitted Observing Wildlife Longitudinally in Washington Square Park in April 2016. WSPEco Projects surveyed wildlife in the park between August and December of 2016. Wildlife seen within the park’s boundaries were formally recorded. Birds that were heard, flew overhead, or were observed outside the park and wildlife that were neither bird, nor squirrel, nor rodent (ex: butterfly) were not recorded officially. Also not counted were birds or squirrels that had flocked around a human providing food. The Eco Projects surveyors walked the same continuous loop through the park a total of seven times in 2016 and recorded 33 different bird species totaling 1,157 individuals. The most number of individuals (350) was recorded on August 31. The most number of species recorded on a single checklist was 15 on October 13. The species observed most often was the House Sparrow (403 across 7 checklists) followed by the Rock Pigeon (383 across 7 checklists). The least observed species, 1 individual in each instance, were the American Kestrel, Brown Creeper, Winter Wren, Carolina Wren, Golden-crowned Kinglet, Swainson's Thrush, Magnolia Warbler, and Swamp Sparrow. House Finches were only observed on one date, December 31st, when 9 were spotted. A single Hermit Thrush was spotted on two separate dates. Our permit was renewed in time for the spring migratory season! So far we have completed two survey walks. In addition to common species such as American Robin, House Sparrows, and Rock Doves (pigeons), we spotted Dark-eyes Juncos and Song Sparrows. We have noticed more European Starlings in the park than we did during 2016 survey. A Red-tailed Hawk was spotted once on our first walk of the season though the nesting pair is active. There are two eyases (baby hawks) in the nest. Check out the live hawk cam at http://www.ustream.tv/channel/e3uYJSDgmbz. 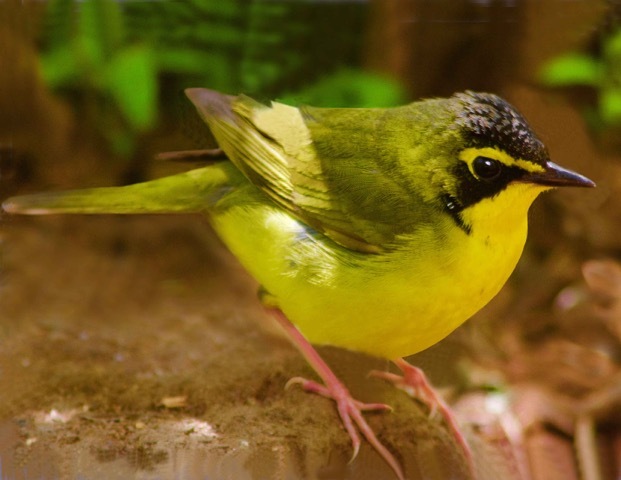 We expect and hope to see a variety of warblers, thrushes, wrens, woodpeckers, chickadees, etc. Please let us know what you are seeing in the park. You can log your animal and plant observations in several places such as on eBird or via iNaturalist where we have two project pages (WSP Wildlife Observations and WSP Plants & Fungi). If you use social media, tag us @wspecoprojects. What’s Next for WSP Eco Projects? Join WSP Eco Projects for two events this spring: a Natural & Social History Awareness Tour on May 5th May 7 with WSP Blog as part of Jane’s Walk 2017 and a Guided Nature Bingo on June 4th as part of the World Science Festival 2017. Look for our pop-up library; we’ll announce the hours and locations on social media. Also, we hope to roll out our urban wildlife education program soon. Washington Square Park is a popular park; it is beloved by local residents and on the NYC to-do list of many tourists. It is also a bio-diverse greenspace that provides numerous environmental benefits, to non-human animals and people alike, and should be stewarded to improve its ecological performance.